There have been some very good pieces written on Greece, but they aren't in the MSM. Here's a sampling of some I have found useful. My criteria, BTW, are that they be clear, logical, factually sound, in line with well understood economics, and largely invective free... in other words, they must generate more light than heat. Peterson Institute for International Economics (PIIE) does very good work. This post by analyst Angel Uribe nicely documents that austerity worked until Syriza upset economic growth, and that the entire Greek debacle has become a battleground for differing economic schools of thought. Jacob Funk Kirkegaard, also of PIIE, has quite a few posts on Greece. Here's one of his best, in which he nicely sums up the intransigence and irresponsibility of Syriza and why Greece's creditors must be unforgiving with them. There are numerous other worthwhile posts on this subject on PIIE's Real Time Economic Issues Watch. How many people are aware that over the five years of the Greek crisis France has managed to shift almost all of its holding of Greek debt -- both by banks and by the French government -- to Germany, Italy, and Spain? No wonder it's the French who are most adamant that Greece be given another chance while nearly everyone else in Europe is disgusted with Greece. And despite the new Finance Minister, Syriza continues to be a clown act. The Independent Institute's analyst Ivan Eland concisely summarizes the argument that it is Greece's own financial irresponsibility to blame and simultaneously documents (and nicely criticizes) Paul Krugman's position that continuing to pour other peoples' money into Greece indefinitely is the answer. And in the comments you'll see hostile responses from readers who imagine themselves "libertarians." Don't these "libertarians" realize they are endorsing raising taxes on people in the rest of Europe (and all over the world since IMF is a party here) to pay for Greek government spending? Good grief! I cited previously, but in sp!ked Tim Black makes a good case for why Greece should simply get out of the eurozone. Analytic philosopher John Pepple has two nice posts on Greece that distill the complex issues to a few clear basic points, something he tends to do quite well. The first, on the disadvantages of debt, I don't fully agree with since, as I've argued, there can be good reasons to take on debt, but he is largely correct -- a person, family, firm, or country should avoid debt unless there's darned good reason for it. Pepple's second looks at the (IMO ridiculous) argument that the Greek referendum was a triumph for democracy, and asks if perhaps all the people in other countries who are expected to bail out the Greeks shouldn't also have a referendum to see if they want to have to pay. Like most impertinent questions, this one is quite appropriate. Here’s the biggest tip anyone could possibly give you to reducing your debt and staying out of debt once you get everything paid down; stop spending more than you make!!! I have hardly blogged on the catastrophe in Greece this year, despite following it closely. I won't write a lengthy post now, but will link to a few pieces I think especially perceptive. The nutshell of my opinion: Greece "qualified" to enter the Eurozone only by accounting fraud (every entrant had to show that national government was fiscally sound). Greek fiscal behavior subsequently worsened, and Greece now lives by borrowing. It borrows not for temporary shortfalls, but because Greeks as a whole consistently, systematically consume more than they produce. The first EU/ECB interventions "imposed" "austerity." The quotation marks around "imposed" refer to the fact that the EU and ECB forced nothing on Greece... they simply required that they would not provide bailout money (ultimately taken from German and other EU taxpayers) unless Greece agreed to their terms. "Austerity" is in quotation marks because it ought to be called "fiscal responsibility." Greece was told it could not continue to consume so much more than it produces. In particular, government spending had to stop growing and Greeks had to start paying for a bigger share of their government's spending, instead of expecting Germans and others to do it. Initially, austerity worked. The Greek economy began to grow. But being self-supporting was, apparently, unacceptable to too many Greeks, and the radical left Syriza party was brought to power. Prime Minister Tsipras, former Finance Minister Varoufakis, and current Finance Minister Euclid Tsakalotos seem to be a pack of madmen. They appear never to have serious proposals to offer to fix anything, and have nearly destroyed the Greek economy which, since Syriza came to power, has been declining. All are Marxists, an utterly silly and bankrupt philosophy... so what did we expect? Most rational observers think this vote is a tragedy. I tend to think this. However, not all agree. Radical socialists (they hardly qualify as rational observers, I admit) are quite happy with the result -- the revolution against the neoliberal hegemony has begun, I guess. Keynesians (e.g. Paul Krugman) also seem to be supportive. After all, in Keynesian theory what is needed is demand side stimulus -- pour money into Greece, let Greeks spend like crazy, and the place will explode with productivity!...only Greece's problems aren't from a business cycle but are from systematic, long term fiscal irresponsibility. While Keynesianism is nonsense on stilts, even on Keynesian terms the Keynesians are wrong, Greece isn't suffering from a business cycle downturn. And there's one other nutty band that seems gleeful over the "no" result -- these are clueless libertarians who imagine that somehow the Greeks have rejected the EU, ECB, IMF, and all the rest of that "new world order" stuff. I've read a fair amount of commentary, mostly in blog comments, by these confused people. They don't seem to realize Greeks generally remain insistent that ECB and IMF bailouts keep coming in. Yes, the Greeks rejected raising taxes in Greece, but this simply means they want German, French, UK, and American taxes raised. Marxists, Keynesians, and clueless libertarians... what strange comrades-in-arms! There's one other group that likes the "No" vote, and this is those who believe this will help destroy the euro and EU. I have some sympathy with this position as well. But I hasten to add it is quite a different one from any of those in the previous paragraph, since it readily admits the contemptible irresponsibility of Greeks as a whole. But anything that helps break the grip of EU bureaucrats on power can't be all bad. Tim Black's piece in sp!ked makes this case rather nicely. 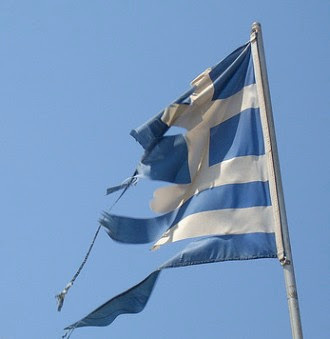 My own official Unforeseen Contingencies position has already been made public: kick Greece out of the Eurozone. Greece will be in economic hell for a period (no economy can survive without a medium of exchange). And unless Greece becomes more, rather than less, free market, it will be there a very, very long time. While I am not a fan of fiat currencies, I am not anti-euro, but euro-ambivalent. Having a single currency across many trading partners greatly lowers transaction costs and facilitates trade. True, it also makes it nearly impossible to use monetary policy for macroeconomic stabilization, but that may well be another benefit. (Friedman says so, and Mises and I concur.) Would the world really be better off with a return to lira and drachma and such? And even though I hate the bureaucratization of Europe via the EU, I don't want to see a "hard unwinding" that would strengthen the hand of Putin, Islamists, and other threats. So may the European leaders kick Greece out of the eurozone, hope they get on with fixing their country by themselves, and start fixing Europe. And because there seems so little clarity in so much of the public discussion, let me emphasize something else: Greece's debacle is a tragedy, and many innocent people are being hurt in it. Some are Greeks, who are watching their economy go to pieces and have no control over anything, and many more are taxpayers in Europe and elsewhere who will ultimately be stuck with the burden when Greece defaults or gets further debt forgiveness. When I condemn Greece and Greeks in general, the reader should understand that responsibility is always an individual matter, never a collective one. Well, OK, maybe this is a lengthy post. Links will appear in a separate post. Debt is prominent in the news: Greece and the rest of the mess in the Eurozone, America's growing national debt, student loans, the infamous mortgage backed securities around the globe, China's current housing and stock market collapses... the list is long and mostly negative. I think it would be instructive to give a little attention to borrowing (i.e. incurring debt) and whether it can be justified. When, if ever, should one borrow? Bottom line: Borrowing for investment can be justified if the investment has sufficient chance of paying for itself, including the cost of borrowing. Well. what about borrowing for consumption that one otherwise could not afford? In general, this is a terrible idea. It can almost never be justified, and it is certainly not sustainable indefinitely. If the borrower does not and won't have sufficient productivity or assets to pay off the debt, she/he/it becomes insolvent. Imagine borrowing for an expensive vacation or an expensive house, knowing you'll likely never have enough to make the loan payments, or imagine a country, call it Greece, borrowing to pay for salaries for legions of unproductive bureaucrats, free health care, munitions, and retirement pensions. None of them -- not the vacation loan, the home loan, nor the loan from the IMF or ECB -- finances anything that has a chance of ever earning a return that will pay off the loan. If the borrower doesn't have sufficient productivity or assets, default ensues. Borrowing at 5% to finance things that pay 0% (or anything less than 5%) is unsustainable and -- usually -- foolish. I've been careful to say that there are exceptions to the rule that one should never borrow to consume, i.e. for a purpose that doesn't pay for itself. Why? Suppose one finds oneself in a temporary shortfall. Say, a person is unemployed, but knows that eventually they'll have good job prospects... borrowing for consumption makes sense in such a case. I did it myself, just after receiving my Ph.D. I had a period of two semesters with little income, but knew I would have a good paying position by the next year. I survived largely on credit cards (plus a little consulting work and my elk hunting skills). When I did begin working, I was able to pay off my debts from the year in less than a semester, and even began enjoying the game of seeing how much austerity I could impose on myself to get them cleared faster. For a country in a crisis -- say, a war for survival, or a business cycle downturn,* it is arguable that the situation is similar -- borrowing to sustain non-productive consumption over the short term might be defensible. But it certainly cannot be a way of life -- it is not sustainable. These principles seem largely to have been missed in public discussions of Greece. For a long time, Greece has been borrowing for consumption. Sunday's "No" vote wasn't a vote to leave the Euro; it was a vote to not cut consumption spending and to not have Greeks themselves pay for this spending... it was a vote for unsustainable borrowing and for further economic ruin for for the Greeks. * I don't actually believe in borrowing for Keynesian countercyclical fiscal policy as a business cycle remedy, but that's an argument about macroeconomic theory rather than debt per se. The Greeks have spoken. Stop discussing bailouts with them. Let them go their own way, on their own. They will suffer like crazy, and go through economic hell, but it will be good for them. As this Greek entrepreneur correctly points out, they can make their country work if they stop whining, get off their crybaby Greek arses, and start producing at least as much as they consume. No further funding. Cut them off. In the long run, it will be good for them. Note: I regret I can't figure out how to post the video interview with entrepreneur Nektaria Kakousi. everyone should hear her insightful analysis. Click the link. It's short and beautiful as well. Happy 4th of July, American Independence Day! My traditional Unforeseen Contingencies Independence Day post is a bit early this year, because on July 4 I expect to be high in the Spanish Peaks of Montana. I will do my usual observance of my favorite holiday, but will be gridless and netless, by design. This is a piece for libertarians, for classical liberals. If you are not such, you’ll likely have no idea what I am talking about. If when I mention “rights” you imagine “health care paid for by someone else” or “the ‘right’ not to hear things that offend” you will be lost. Similarly, pseudo-libertarians, such as Rothbardian anarcho-capitalists, who imagine that the U.S. and the USSR are morally identical, will be nonplussed. Too bad. Humans’ greatest political achievement is the United States of America. This is the only country founded on the principles of individual liberty. There’s no more important or valuable political (i.e. social) principle. Individuals who respect each other’s liberty, each other’s rights, can live in complete harmony together. They need not agree on religion, personal ethics, or anything else – but if each agrees to respect each other’s right to live as he pleases, all will have a peaceful and free society, and economics shows they’ll have a prosperous one as well. They need only foreswear initiating force, i.e. using coercion to try to shape each other’s personal choices. America was founded precisely on these principles, and it has been remarkably successful. No other country can claim this. No other political project can claim this. The haters of America seem to have the upper hand these days. The President is busily working to forge a treaty that will allow the apocalyptic-minded mullahs of Iran to build nuclear weapons (while pretending to do the opposite), sabotaging American allies (most notably Israel), while at home legislating by executive fiat to institute socialized medicine, gun control, and other tyrannies. The left is campaigning, with some success, to shut down free speech and expression and the most innocent action (try buying a “Dukes of Hazzard” matchbox car and you’ll be branded “racist.”) Churches and synagogues that adhere to their Scriptures are about to be attacked in the courts for refusing to kowtow to the Alice-in-Wonderland ramblings that Justice Kennedy offered in lieu of legal logic in Obergefell. And Russia and China wage cyber war on the U.S. Yes, America and American ideals are under assault from enemies within and without. They are on the offensive. They seem to be winning. So all is lost, America is finished, liberty is obsolete, and we should surrender, right? This is the most profound and important political principle ever discovered. (Emphasis on "discovered" because this is not "socially constructed" and hence arbitrary.) Now that men have understood this objective truth, there’s no putting the genie back in the bottle, getting the cat back in the bag, or whatever metaphor you prefer. Marxists, including today’s PC cultural Marxists, hope to return to the days of governance by elites. Mercantilists (“crony-capitalists” for all of you who haven’t yet taken my History of Economic Thought courses) hope for the same (but have a different set of elites in mind). But they all are in defiance of some of the most powerful principles humans have ever discovered, and they will lose. All that is necessary is that they be confronted with people who understand and are willing to fight for reason, rights, and liberty. In these dark times – and they are very dark – I remain very optimistic. A second American Revolution is coming! We – I speak to those readers who are genuinely interested in liberty – have the ideas and the tools we need to defeat the enemies of liberty and build a free and prosperous world. And because of unforeseen contingencies – the occurrence of things, events, and opportunities that no one ever imagined (I believe our American Forefathers called this “Providence,”) I am quite sure that ultimately our cause will win. But whether it will win in our time is a very different question. The thirst for individual liberty is a universal value – one must abuse and corrupt a person terribly to beat it out of him, and once he understands this value any thoughtful and empathetic person desires it for others as well. But whether this value triumphs in our lifetimes depends on what we do. History has placed on each of us a responsibility, a burden, to promote the American ideals. The world is in desperate need of a second American Revolution, an intellectual, moral, and spiritual revolution that insists on Reason, Rights, and Liberty as absolutes. It’s our job to conduct this revolution. The great liberal Thomas Jefferson observed that by 1776 the real American Revolution – the revolution in men’s minds and hearts – had already occurred. It’s now 239 years later, and too many hearts and minds are muddled. It’s our job to re-awaken them to the great truths of classical liberalism. Let’s get on with it.